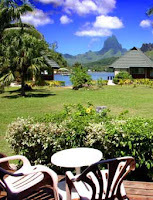 Club Bali Hai has the most stunning view of any accomodations in Moorea. It's also the first place that I stayed in French Polynesia. For me, Moorea is the magnificent bays. I loved watching the clouds pass in front of the mountains. Being on the bay, the water is deep and dark (it gradually but quickly gets deep). There is just a tiny beach there. It has a funky, 60s decor. I stayed in a Bayview room, which included a fully equipped kitchenette. I must admit that I paid about half of the current price less than five years ago. The value choice here is an overwater bungalow. The CBH's don't extend far into the water like the resorts but still they are very choice accomodations given the incredible view. One bedroom Beachfront Bungalows with kitchenette are 213 Euros ($275 U.S. as of 1/27/07), including breakfast. Overwater Bungalows with kitchenette are 220 Euros ($282.00 as of 1/27/07), including breakfast. They also have Gardenview rooms which only have a refrigerator. The prices for these are not shown on their Web site. In the back of the Bayview building there are the Mountianview rooms, with only a fridge. They are not mentioned on the site at all, however, I did stay in one when I extended my stay there. They face the road and I found the room depressing after being spoiled by the stunning Bayview I had previously. CBH is close to two supermarkets, restaurants, has its own restaurant that serves breakfast and lunch, there is a gas station across the street where you can purchase snacks and drinks. Wednesday nights they have a free Tahitian dance show.